You can read a lengthy review of my latest solo exhibition 'SCREEN' written by artist, writer and sometimes exhibition organiser, Michael Shaw at a-n (artist's newsletter) online. Michael Shaw studied his BA (Hons) Fine Art at Leeds Metropolitan University (1993-96) and completed his PhD in Sculpture at the University of Gloucestershire in 2005. He has completed many commissions and public projects including a permanent sculpture for Gleeson Homes, Peak District and 'Neon Ice House' - a permanent sculpture for Burghley Sculpture Garden, Sheffield Council Winter Gardens and the V&A Museum. Otter Gallery, Chichester; Babylon Gallery, Ely; Hans Price Gallery, Weston-Super-Mare: Alternatives Gallery, Rome; Il Gianicolo, Perugia, Italy; Thelma Hulbert Gallery, Honiton – touring to 20/21 Visual Arts Centre, Scunthorpe; MAC,Birmingham and ; Red Gallery, Hull; Clapham Picture House, London; The Study Gallery, Poole & South Hill Arts Centre, Bracknell; Schwartz Gallery, London and Gallery Oldham. 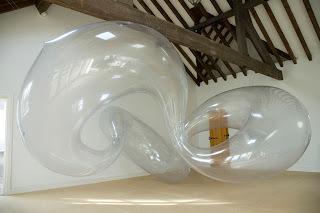 Michael is currently developing a new giant breathing inflatable that will pass from room to room in the City Gallery, Peterborough in September 2013. He is also pleased to reveal his participation in the Sculpture on the Beach festival in Aarhus Denmark in June 2013. I am a painter concerned with visual perception, in particular, examining and challenging theories and methodologies of light and movement within the second dimension. I studied my Masters at The Slade School of Fine Art (UCL) and since 2000 have been an independent professional artist. For a full CV see www.pip-dickens.com. All images unless otherwise indicated are copyright Pip Dickens.. Simple theme. Powered by Blogger.